"Important" activities of "important" people on this "important" planet get big media coverage. Fifty-foot high video billboards in the center of the city, full-page ads in major papers, and TV commercials are all designed to help us all appreciate the importance of such people and their "important" activities, and sell product. But because nothing happens on this tiny, temporary planet that's really that important, we surround our human events with hype to trick ourselves into thinking that they are. Big light shows, huge, elevated stages, booming sound effects, pyrotechnics, advertisements ad nauseam, and miles of magazine covers are essential components of the show business of the material world. So, when contemplating the idea of the appearance of God Himself, those of us steeped in the contemporary culture of hype might naturally expect a grandiose production, reminiscent of the best that Hollywood has to offer, calculated to inspire awe and fear. "Thereafter, at the auspicious time for the appearance of the Lord, the entire universe was surcharged with all the qualities of goodness, beauty and peace. The constellation Rohini appeared, as did stars like Asvini. . ."
This might be very useful and interesting information for you Vedic astrologers. "The sun, the moon and the other stars and planets were very peaceful. All directions appeared extremely pleasing, and the beautiful stars twinkled in the cloudless sky. Decorated with towns, villages, mines and pasturing grounds, the earth seemed all-auspicious. The rivers flowed with clear water, and the lakes and vast reservoirs, full of lilies and lotuses, were extraordinarily beautiful. In the trees and green plants, full of flowers and leaves, pleasing to the eyes, birds like cuckoos and swarms of bees began chanting with sweet voices for the sake of the demigods." The narrator makes a point of describing Krishna as "birthless," because that is the fact. He has no "birth" the way we do. We're born into the bodies we're born into because of our karma, our destiny. But Krishna is the supreme controller. He appears and disappears from our sight whenever and wherever He likes. Almost immediately then, under cover of night, Krishna was mystically whisked away to the remote cowherd village of Gokula, Vrindavan, so that no one but Devaki and Vasudeva would know that He had appeared. Krishna's appearance was as undercover as could be. "The Lord is one, but He can appear in everyone's heart by His inconceivable potency. 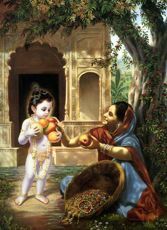 Thus although the Lord was within the heart of Devaki, He appeared as her child. . . the Lord appeared like the sun . . . the Lord is situated even within the atom . . .He is situated in Mathura, in Vaikuntha and in the core of the heart. Therefore one should clearly understand that He did not live like an ordinary child in the heart or the womb of Devaki. Nor did He appear like an ordinary human child, although He seemed to do so in order to bewilder asuras [atheistic persons] like Kamsa." In other words, Krishna appears to take birth—and even "die"—here, just like us, so that determined atheists can tell themselves and others, "Look! Krishna is just an ordinary guy!" Krishna doesn't mess with their view of reality. "The asuras wrongly think that Krishna took birth like an ordinary child and passed away from this world like an ordinary man. Such asuric [demonic] conceptions are rejected by persons in knowledge of the Supreme Personality of Godhead . . .The Lord is aja, unborn, and He is the supreme controller of everything. Nonetheless, He appeared as the child of Devaki. Krishna is very kind to come see us. He doesn't have to. We may try our best to maintain the illusion that people, places, and events in this world are so important, but once we begin to understand the significance of Krishna's appearance, it's possible to see everything here in its proper perspective. It's not that big of a deal. But Krishna coming—that's a big deal.